She is listed as Fannie Hallman on her son Jonas' death certificate. Found her on the 1850 (not stated), Lincoln, North Carolina census (img 19) as Frances Finger age 30. Found her on the 1860 (not stated), Lincoln, North Carolina census (img 19) as Frances Fingerage 40. Found her on the 1870 Union, Lincoln, North Carolina census (img 14) as Frances Finger age 50. Found her on the 1880 Ironton, Lincoln, North Carolina census (dist 101 img 25) as Anna Finger, age 59. She is living with her daughter Laura and her husband John Mullen. Found her on the 1930 Jerusalem, Yates, New York census (dist 9 img 16) as Lola E. Carvey age 35. Found her on the 1920 Manhattan, New York, New York census (dist 1117) img 3) as Tessie Finger age 26. Found her on the 1925 Bronx, New York state census as Tessie Finger age 31, Housework. Address: 2719 Morris Ave.
Found her on the 1930 Bronx, Bronx, New York census (dist 661 img 36) as Tessie Finger age 37. Found her on the 1940 Bronx, Bronx, New York census (dist 3-1326B img 11) as Tessie Finger age 47. Found him on the 1910 Civil District 10, Blount, Tennessee census (dist 26 img 8) as James C. Anderson age 6. Found him on the 1920 Civil District 10, Blount, Tennessee census (dist 26 img 16) as James Anderson age 15. Found her on the 1920 Caldwell, Catawba, North Carolina census (dist 29 img 23) as Mary H. Beard age 5 months. Found her on the 1930 Caldwell, Catawba, North Carolina census (dist 2 img 6) as Mary H. Baird age 10. Found her on the 1900 Perry, Wyoming, New York census (dist 130 img 36) as Lucy Copson age 14. Found him on the 1870 Kingston, Ulster, New York census (img 110) age 11. Found him on the 1880 Ironton, Lincoln, North Carolina census (dist 101 img 4) age 3. Found him on the 1920 Cherokee, Spartanburg, South Carolina census (dist 85 img 7) as Rachael V. Ezell age 5. Found her on the 1930 Chesnee, Spartanburg, South Carolina census (dist 23 img 1) as Rashel P. Ezell age 16. Found her on the 1920 Paulsboro, Gloucester, New Jersey census (dist 151 img 37) as Bertha R. Dersch age 22. Father born New Jersey, mother born Germany. Found him on the 1900 Penn Yan, Yates, New York census (dist 143 img 9) as William S. Finger age 23, boarder. His occupation is basket maker. Found him on the 1930 Milo, Yates, New York census (dist 3 img 23) as William S. Finger age 53, laborer, basket factory. According to Lakeview Cemetery (Penn Yann) records, William S. Fingar was born 1878, and died 1946. Buried next to him is his wife Anna E. Fingar 1864-1945. Found her on the 1880 New Albany, Floyd, Indiana census (dist 74 img 36) as Emma Finger age 5. Found her on the 1900 New Albany, Floyd, Indiana census (dist 68 img 2) as Emma Finger age 25, single, living at home. Sales lady, dry goods. Found her on the 1910 New Albany Ward 2, Floyd, Indiana census (dist 71 img 1) as Emma Broecker age 35. Address: 411 Seventh St.
Found him on the 1910 Robinson, Washington, Pennsylvania census (dist 226 img 12) age 17, laborer glass house. His WWI draft registration card lists his birth date as Nov 28 1894, born McDonald, PA.
Found him on the 1920 Steubenville Ward 3, Jefferson, Ohio census (dist 222 img 15) as George Finger age 25, electrician, steel mill. Found him on the 1930 Steubenville, Jefferson, Ohio census (dist 31 img 23) as George Fingers age 35, electrician, power plant. His WWII draft registration card shows his birth as Nov 28, 1884. Perhaps this is a typo, since he lists his age as 47. The typewritten name on the card is George E. Fingers, but he signed it George E. Finger. Found him on the 1880 Peshtigo, Marinette, Wisconsin census (dist 100 img 26) as Lorance Finger age 3. Found him on the 1900 Grover, Marinette, Wisconsin census (dist 131 img 7) as Lawrence Finger age 24, single, living at home. Farm laborer. Found him on the 1910 Grover, Marinette, Wisconsin census (dist 76 img 8) as Lawrence Finger age 33, farmer. His 55 year old widowed mother is living with his family. Found him on the 1920 Grover, Marinette, Wisconsin census (dist 135 img 6) as Lawrence Finger age 43, farmer. Found him on the 1930 Grover, Marinette, Wisconsin census (dist 9 img 15) as Lawrence Finger age 53, farmer. Found him on the 1900 Manhattan, New York, New York census (dist 710 img 1) as Louis Finger age 9. Found him on the 1905 Manhattan, New York, New York census state (A.D. 26 E.D. 13 img 62) as Louis Finger age 16, grocery clerk. Found her on the 1910 Brooklyn, Kings, New York census (dist 1081 img 17) age 4. Found her on the 1920 Brooklyn, Kings, New York census (dist 492 img 19) age 20. Found him on the 1900 Catawba Springs, Lincoln, North Carolina census (dist 106 img 22) as Sidney M. Finger age 15. Found him on the 1910 Catawba Springs, Lincoln, North Carolina census (dist 66 img 5) as Morris Finger age 25, farmer. His uncle, Edmund Asbury is living 3 dwellings away. Found him on the 1920 Catawba Springs, Lincoln, North Carolina census (dist 101 img 11) as Sidney Finger age 35, farmer. Found him on the 1930 Stanley, Gaston, North Carolina census (dist 35 img 17) as S. Morris Finger age 43, salesman, dept store. Found him on the 1870 Caldwells, Catawba, North Carolina census (img 17) age 6. Found him on the 1870 Roane, Tennessee census (dist 4 img 28) as Wm H. Finger age 9. Found him on the 1880 District 10, Blount, Tennessee census (dist 193 img 15) as William Finger age 19. His future wife Alice Parham is living next door. Found him on the 1900 Civil District 8, Blount, Tennessee census (dist 19 img 11) as William H. Finger age 39, day laborer. Found him on the 1910 Civil District 10, Blount, Tennessee census (dist 26 img 2) as William H. Finger age 49, farmer. Found him on the 1920 Civil District 10, Blount, Tennessee census (dist 26 img 24) age 58. Found her on the 1920 Civil District 10, Blount, Tennessee census (dist 26 img 21) as Laura Gibbs age 9. Found her on the 1930 District 10, Blount, Tennessee census (dist 18 img 29) as May L. Gibbs age 19. Found her on the 1900 Charlotte Ward 1, Mecklenburg, North Carolina census (dist 44 img 25) as Jessie Asbury age 26. No Children. Father, mother born North Carolina. Found him on the 1920 Hollywood, Duval, Florida census (dist 82 img 30) age 2. Found him on the 1850 (not stated) Catawba, North Carolina census (img 38) as Anthony Ikard age 35, farmer. Also in his household is Eliza Sims age 18. Found him on the 1860 (not stated) Catawba, North Carolina census (img 65) age 45, farmer. On his daughter Mary Malinda's death certificate it shows Anthony's wife's maiden name as Annie Finger. Found him on the 1900 South Point, Gaston, North Carolina census (dist 84 img 15) as Henry Keever age 31, farmer. HEPPEL - Burnette "Bernie" (nee Kruser) May 30, 2010, beloved wife of Charles Heppel; devoted mother of Maureen (Joseph) Leibinger and Darleen (Neal) Nesselbeck; grandmother of Lisa Nesselbeck. Friends may call Tuesday from 2-4 and 7-9 PM at the DIETRICH FUNERAL HOME, INC., 2480 Kensington Ave., Amherst. A Funeral Service will be celebrated Wednesday at 11 AM at Crossroads Lutheran Church, 4640 Main St., Amherst. Flowers are gratefully declined. Memorials may be made to Niagara Hospice, 4675 Sunset Dr., Lockport, NY. Found her on the 1925 Buffalo, Erie, New York state census (A.D. 05 E.D. 04 img 2) as Burnette Kruser age 2. Found her on the 1860 Clay, Onondaga, New York census (img 41) as Jane Littleboy age 8. She is not seen on any census after 1860. Found him on the 1850 Highland, Defiance, Ohio census (img 4), age 71, farmer. He and wife Hannah, age 60, are living in the household of their son Tiel, age 40. Found him on the 1900 Milo, Yates, New York census (dist 140 img 16) as Willard Newby age 40. Father, mother born England. Found her on the 1900 Saugerties, Ulster, New York census (dist 133 img 13) as Martha A. Porter age 11. Her middle name is Blu on her husband's WWI draft registration card. Her death certificate shows her birth as 8 Aug 1876. Found her on the 1880 Howards Creek, Lincoln, North Carolina census (dist 103 img 7) as Carrie Robinson age 2. Found her on the 1900 Lincolnton, Lincoln, North Carolina census (dist 110 img 30) as Carrie B. Finger age 21. Found her on the 1910 Ironton, Lincoln, North Carolina census (dist 69 img 16) as Carry B. Finger age 30. Found her on the 1920 Newton, Catawba, North Carolina census (dist 44 img 15) as Carrie B. Finger age 39. Although her birth certificate shows her birth as 14 April 1874, her age on census records consistently point to 1876, and the 1900 census shows April 1876. Found her on the 1900 Ironton, Lincoln, North Carolina census (dist 109 img 33) as Glenny Keener age 24. Found her on the 1910 Lincolnton Ward 2, Lincoln, North Carolina census (dist 72 img 10) as Glennie Keener age 34. Found her on the 1900 Ironton, Lincoln, North Carolina census (dist 109 img 5) as Allie May Rudisill age 16. Found her on the 1910 Ironton, Lincoln, North Carolina census (dist 69 img 45) as Allie May Dellinger age 27. Found him on the 1910 Benton, Yates, New York census (dist 173 img 2)as Roy A. Tears, age 10. Found him on the 1920 Benton, Yates, New York census (dist 174 img 8) age 20, laborer, single, living at home. Found him on the 1925 Benton, Yates, New York state census (AD 01 ED 03 img 6) as Roy A. Tears age 25, single, living at home. Found him on the 1940 Benton, Yates, New York census (dist 62-10 img 5) as Roy Tears age 40, single, living at home. Farm laborer. Baptism sponsors Jacob Decker and Sartje Spoor. Found him on the 1850 Sodus, Wayne, New York census (img 9) as Jacob Tinklepaugh age 64, farmer. Also in his household is Perry Moody age 16. Found her on the 1880 New York City, New York census (dist 252 img 26) as Pauline Weber age 21, house work. She is single and living at home. Found her on the 1880 Potter, Yates, New York census (dist 222 img 26) as Carrie E. Wells age 2. Found her on the 1940 Potter, Yates, New York census (dist 62-20 img 3) as Carrie E. Wells age 62, single. 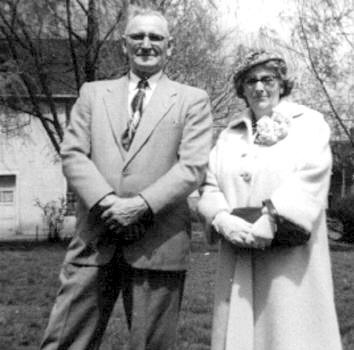 She is living with her widowed brother Edward M. Wells age 69, farmer. Found her on the 1910 Buffalo Ward 21, Erie, New York census (dist 206 img 28) as Mable Wilgus age 18.